For more inspiration The Quiet Revolution is on Facebook. This entry was posted in Blogging, Current Issues, My Life, Quotes and tagged Becoming, Blogging, Courage, empowerment, Introverts on March 27, 2015 by Deborah Drucker. Love that, but I think that sometimes it depends on what’s going on at that particular time in life. Yes, there are many demands on our time but this has to do with our free time. And we all must have some of our own free time to stay sane. Then what we do with it must truly be up to us. I’m trying, Deborah; it’s a bit easier in retirement. Quiet time is like rest to me. It’s rejuvenating. Without it, my mind feels overloaded. It’s when I’m still that I’m the most creative. 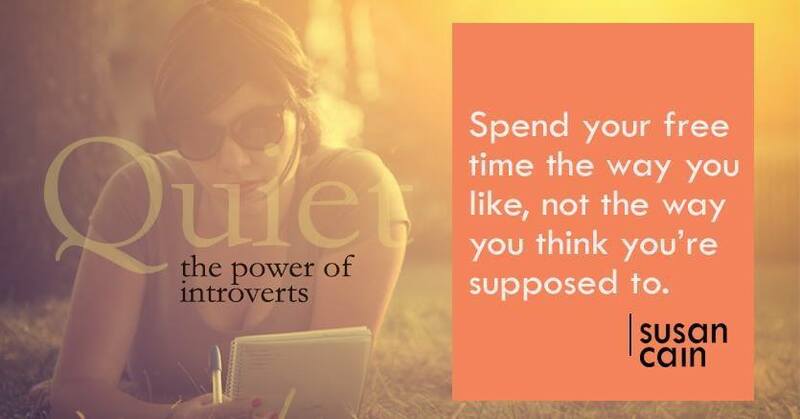 Yes it is from the Susan Cain Facebook page. Encouraging words… Something that should be so simple, yet at times so difficult. Isn’t this the truth? I know too many people who just don’t have free time because they feel like they have to be cleaning, shopping, running errands, doing, doing, doing- I’m not saying through all these things by the wayside, but you need to have free time, too.